Two bands could not have less in common and yet at the same time sound as near to each other as blood relatives. Disorder, a Joy Division tribute band, is comprised of members way too young to have first-hand familiarity with the music they resurrect. The group which they are covering has a repertoire built mainly from two studio albums with about a dozen songs on each, its full development having been cut short by the untimely suicide of lead singer Ian Curtis in 1980, a mere two years after having gotten started. At least ten of their songs are widely recognized and popular. 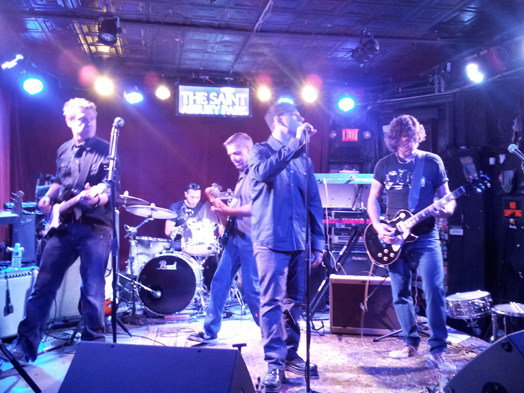 The Saint, a classic, Jersey shore dive bar provides a gritty, highly conducive environment for live, punk music. Besides the garish Xmas lighted walls and spacious, elevated stage, it boasts a superb sound system and sound engineer who delivered feedback-free audio which was clear and loud, but bearable. A particularly superb job was done with the unmistakable and widely covered “Dead Souls,” a mesmerizing and demented anthem that, perhaps more than any other piece, represents the mystique of the parent band. Lead vocalist Michael not only captures the vocal qualities of the late Ian Curtis, but his agitated and sometimes spastic gestures as well. Better than any grainy, antique film footage from 1979-1980, Disorder delivers the most credible, if vicarious experience of Joy Division that can be imagined. Here’s a comparison I can’t prove, but I believe to be true: Joy Division, an iconic band of great notoriety and with a cult following, existed for about 2 years, has two albums and not more than ten songs that can be recognized as hits. Modern English, still immensely entertaining and prolific after thirty-plus years has one hit that is probably essential to more record collections, iTunes libraries, on more iPods, iPads, and mp3 players than everything by Joy Division combined. 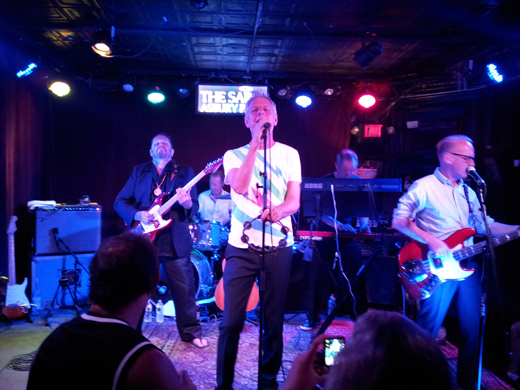 In any event, Disorder’s revival of the Joy Division’s body of work and Modern English’s ongoing greatness combined to provide a uniquely entertaining and satisfying treat for rock music fans who have a love for the genre as well as a historical perspective. 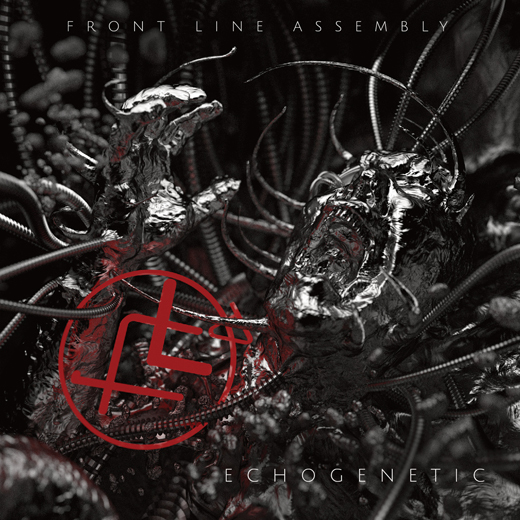 In the 26 years since Bill Leeb left Skinny Puppy, Front Line Assembly has moved in fits and starts through industrial, disco and metal to an increasingly electronic style but always featuring Leeb’s penchant for intensity and harsh themes. FLA’s latest release, “Echogenetic,” represents their 18th studio album, containing eleven tracks. Fans of FLA and of industrial in general, need have no fear: This opus upholds the every essence of the genre as they have come to love it. The first track, “Resonance” is a slow-paced, emotionally burdensome slog through an electronic swamp with eerie male choral interludes, followed by “Leveled” which introduces a complex and disorienting rhythm, vocals in Leeb’s signature theatrical whisper, a vastly arrayed synthetic soundscape and a delicate bridge of light sounds. “Killing Grounds” starts with a menacingly rapid, galloping rhythm, brings in distant, undecipherable vocals, and then intermittently slows to a very danceable march. “Blood” starts out with growling synthesized noise, and then features Leeb’s full-throated singing alternating with the hissing, hostile cries that are the familiar voice of FLA. “Deadened” has a traditional industrial feel, is moderately paced, containing distorted voices, some interesting lyrics and melodious hooks. “Ghosts” starts with a weighty, menacing, slow pace then switches from minor to a major chords for most of the track, gliding back into minor key solemnity as soothing strings intervene to provide short term relief. It would be impossible to sit still while listening to these compelling anthems. “Echogenetic,” the title track, begins with a misleadingly pleasant, pizzicato string opening, followed by harsh electronic distorted human and instrumental voices and a dragging rhythm that would actually be too slow to dance to. “Exhale” returns to the signature FLA style, with Bill Leeb vocals and a mesmerizing cadence that will compel listeners to get up and dance. Imagine dancers alternating between frantic, robotic moves and zombie-like catatonia during the erratic beat and rapidly shifting scenario of “Prototype”. “Exo” recalls classic FLA, sure to please industrial nostalgia buffs. Finally, “Heartquake” closes the album with computer-generated voices (a la Laurie Anderson) in a rondo of dialogue with Leeb’s natural growl. Aspiring young rockers tend to study the guitar or drums less nowadays, favoring all the electronic, computer-generated and synthetic means of producing music. FLA has a generation-sized head start in that direction. This album, completely guitar-free, demonstrates their total mastery of the new and future genre of techno-industrial music.